Tesla Inc. CEO Elon Musk admitted late Monday there was a braking issue with the Model 3 sedan— which began arriving in Canada last week — pointed out by Consumer Reports, and said it can be fixed with a firmware update that the electric car maker will roll out in a few days. "Model 3 now has improved ride comfort, lower wind noise & many other small improvements," Musk wrote in another tweet. Consumer Reports on Monday said it will not recommend the affordable Model 3, seen as key to Tesla's profitability, as it braked slower than a full-size pickup. 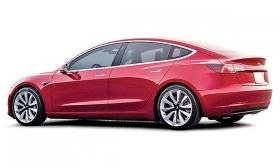 The magazine criticized the Model 3 for having overly long stopping distances and a difficult-to-use center touch screen. Research analyst Frank Schwope at NordLB called the report a really bad advertisement and could discourage new customers.